Freezer bags, for storage, if you’re not having a party. Can’t make just “a little” of this. COOK’S NOTES: You cannot make good beans without good sausage. If you don’t already have a favorite, buy small quantities at your local grocery and see what you like. Also, remember good beans must be cooked slowly. If you try to speed it up with too much heat, the beans will never get tender enough. I learned this the hard way. This recipe is about taste. You will learn what you like and how to adjust liquids, sweet and sour as you go along. A pinch of red pepper flakes is good, if you like it with a little more pop. Always have Louisiana Hot Sauce (or your preferred brand) at the ready when you serve. Rinse beans in warm water. Pour away water. In blender, add 1 cup carrot sticks and enough water to puree them. I know this sounds weird, but trust me and Rosalie. Leave the carrot slush in the blender for now. Heat Dutch oven on a medium burner. 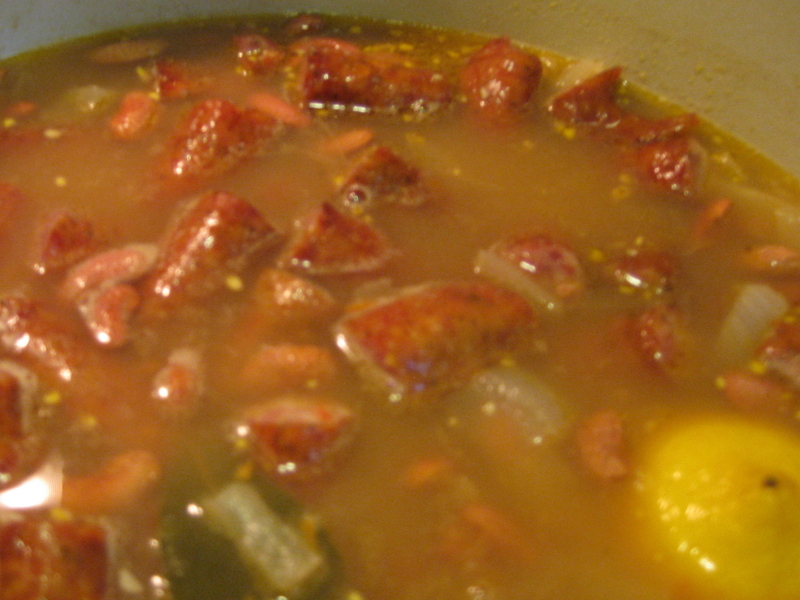 Add sausage with 1/2 cup of water. Cover. 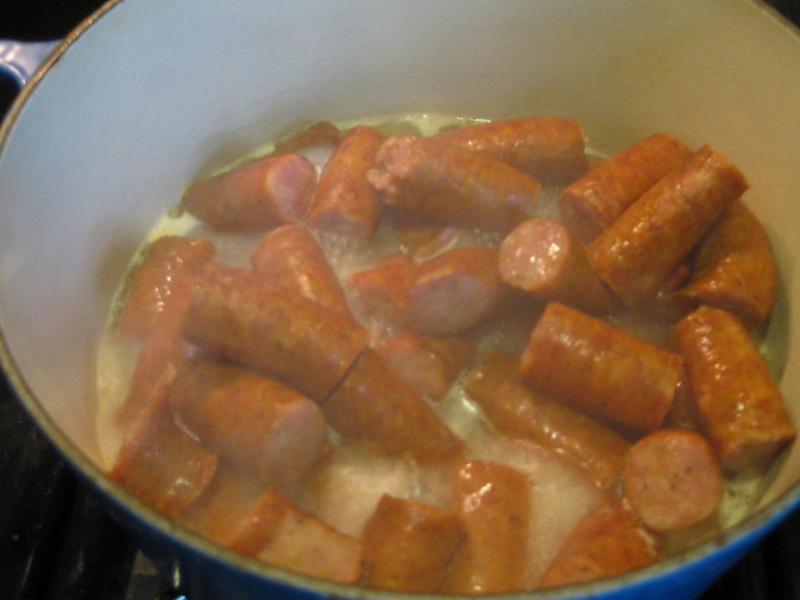 Cook sausage about 5-7 minutes. You’re not cooking the sausage. You’re sweating out some juice to start your beans in. Remove sausage to plate. Leave the juice in your Dutch oven and layer bay leaves, roughly sliced onions, garlic, 1 tsp sugar and a pinch of salt and pepper. The goal is to heat the bay leaves to sweat out flavor oils. Watch this and don’t let anything singe. Feel free to stir after a couple of minutes. If it looks like it needs water, add a little. Cook this mixture 5-10 mins. 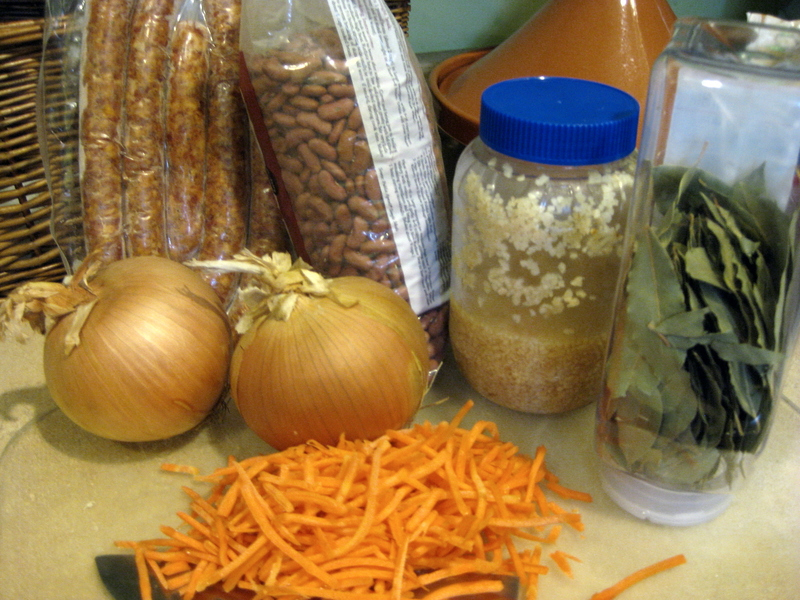 Add the carrot slush from the blender, your rinsed beans and enough water to cover the beans. 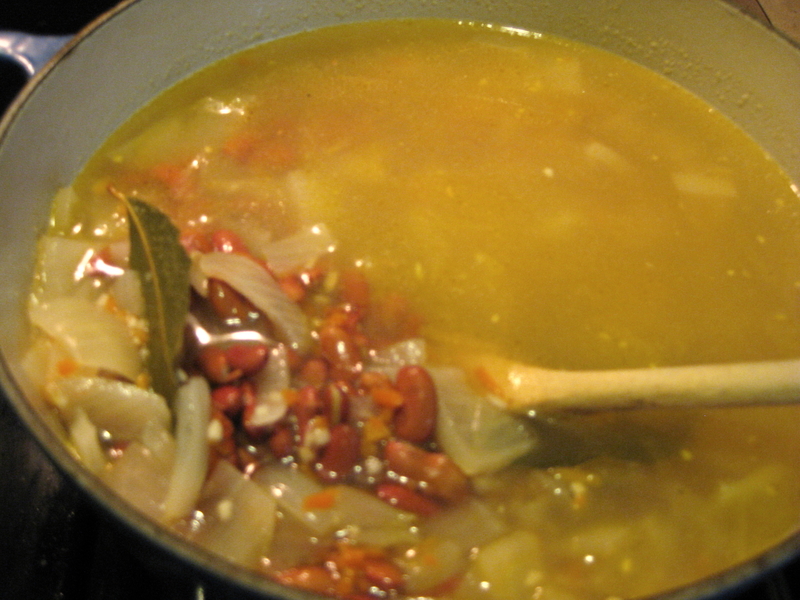 Remember, the beans will absorb water as they cook, so you will need to add a little water every now and then. The trick is to figure out how much is enough without being too much. We’ll talk about thickening as this gets done. Bring your beans to a slight boil. Stir every 10 minutes or so but don’t overdo it. You don’t want to break the beans as they get more tender. Turn down the heat and simmer uncovered. Return the sausage to the pot. Don’t add any more salt until you’ve cooked 10 minutes. Remember, sausage has salt to impart to juice. Taste the water and see what you think. Add 1 teaspoon vinegar. It’s important to taste as you go along. Bean flavor depends on good juice. Now, you’ve got a sweet-sour-salty thing going on. This balance will determine what you want it to taste like. Continue to simmer and stir every 10 minutes. Make sure the simmer isn’t too “hard.” Does it need more water? The object is to keep the beans just barely under water. After an hour of slow simmer, taste your beans for tenderness. You don’t want them so tender that they all fall apart. Keep testing periodically until you’re satisfied. Beans should be getting done soon. Add juice of half a lemon. Adjust other flavors as needed. 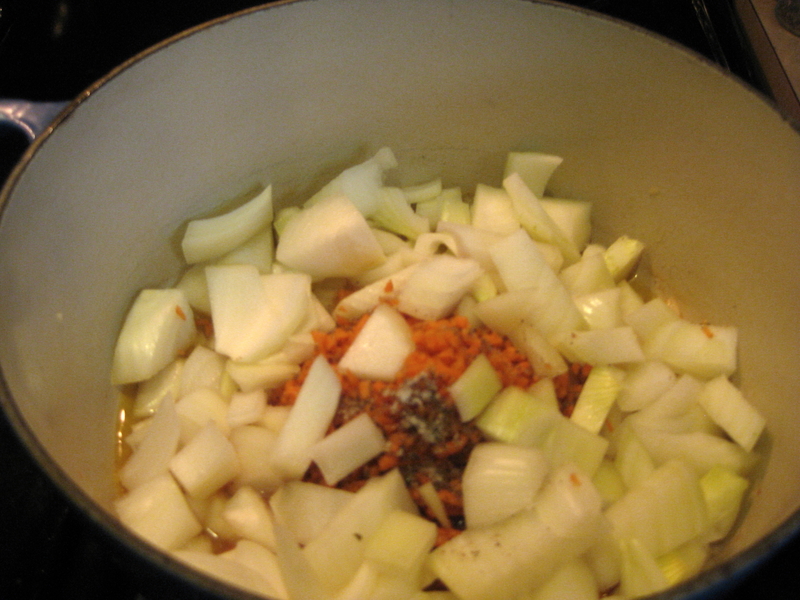 Add pepper flakes now, if you like. Taste and make final adjustments like salt, sweet/sour, if necessary. If you think it’s too sweet, a little lemon/vinegar can offset it. Reverse also is true. Remember: Whenever you use bay leaves to flavor a recipe, retrieve them from the finished dish before you serve it. While I have never eaten a bay leaf, my mother, Betty, swore repeatedly it would kill you if you did. ‘Nuff said. SERVE: Serve 3-to-1 beans to rice. Rice goes on the bottom, then beans and sausage. Another version – serve with a scoop of rice centered on top of the rice. Serve with hot garlic bread and a green salad. NOTE: Try to make more beans than you can eat at one sitting. They get better with a little time in the fridge (like 2-3 days). They also freeze very well for a dinner treat later without any of the hassle or time required. OVEN – Preheat 325 degrees. With bread knife, slice loaf down center, lengthwise (horizontally to counter). Open bread, insides up. Spread butter mix onto insides of bread. Put bread back together, and wrap well in foil. Place bottom-up on baking sheet. Heat 10 minutes. Turn top-side up and heat another 10-15 minutes. If you like your bread crunchier, peel back the foil when you turn it top-side up. Remove from oven onto cutting board and slice across for serving in a bread basket. Cover with clean kitchen towel to help keep it warm (if it lasts that long). 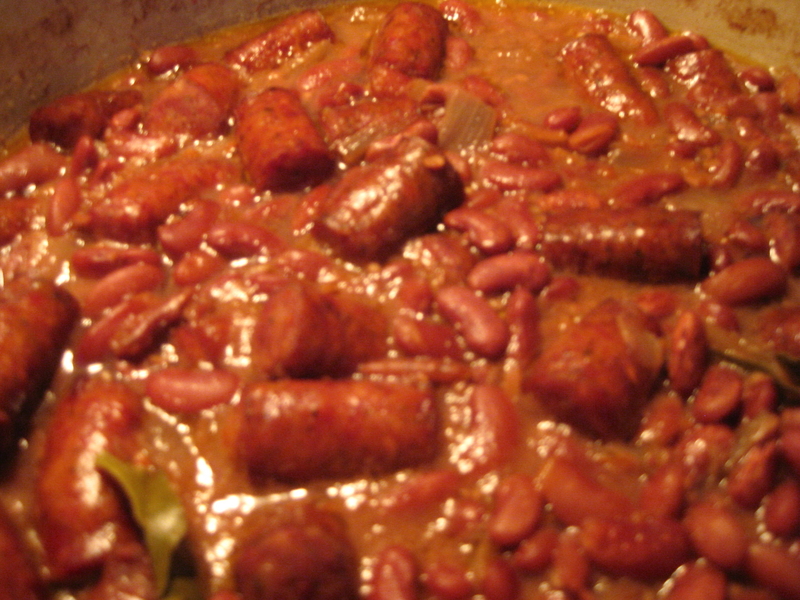 With red beans and rice, plus garlic bread, you are now officially cookin’ New Orleans. Come back to “Southfacin’ cook” at New in NOLA for Patsy’s basics to Southern cooking and eating. Contact her with suggestions, questions or requests at patsy.brumfield@gmail.com. Mmmmmmmm. This makes me so hungry. What type of sausage do you use? And I want a whole loaf of that garlic bread to myself. Gosh, that sounds good.